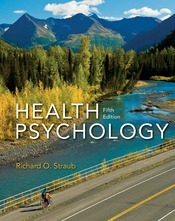 Richard Straub’s Health Psychology provides the most accessible, current, and engaging introduction to health psychology today. Richard Straub’s Health Psychology shows students how psychology and health are interconnected. Using real world examples, Straub encourages students to make meaningful connections between the science of health psychology and their own everyday experience. Health Psychology is comprehensive in its approach and incorporates the latest research as it examines the field’s main ideas and models a scientific way of thinking about those ideas.